Simple, but adorable wedding annoucement. "And two shall be as one". 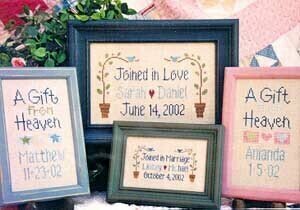 Has room for the bride and groom's names and wedding date. Stitch Count: 156W x 65H. (DMC alternates are 470 317 322 3685 502 930 341 899 3021 841). Shown with buttons from Just Another Button company (sold separately) and a small gold heart charm. Four more spectacular wedding designs from Stoney Creek. Includes "Marriage Blessing" (May your joys be as sweet as spring flowers that grow, as bright as a hearthfire when winter winds blow, as countless as leaves that float down in the fall, as serene as the love that keeps watch over all)stitch count 133x202, "Love Poured Out" (God has poured out His love into our hearts by the Holy Spirit whom He has given us)stitch count 113x201, "Wedding Prayer" (God Almighty send you His light and truth to keep you all the days of your life. The hand of God protect you. 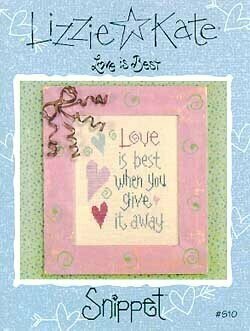 May God the Father, Son and Holy Spirit cause His grace to be mighty upon you)stitch count 108x159, and "My Best Friend" (This day I marry my best friend, the one I laugh with, live for, love)stitch count 94x200. All designs have room for personalization. 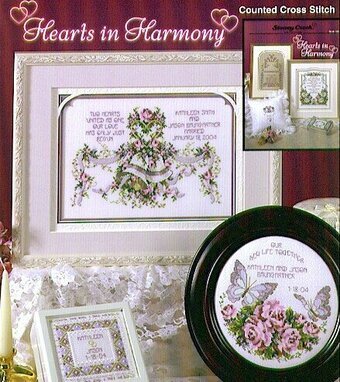 A wonderful collection of designs including "Sweet Companionship" (In love and sweet companionship, with hearts of faith and cheer - together may you keep the path through many a happy year.") 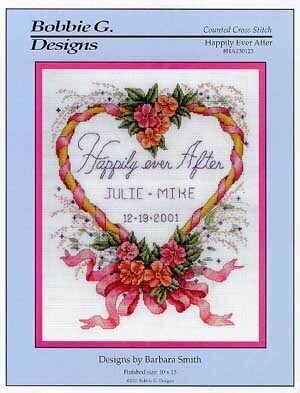 stitch count 127x143, "With this Ring" stitch count 67x67, "New Life Together" stitch count 101x104, "Love Has Just Begun"stitch count 151x98, "Marriage Sampler"stitch count 95x157, "Ring Bearer's Pillow" stitch count 31x34, and "One Love. "Stitch count 49x34. Model stitched on over 2 threads on 32 Ct. Dirty Belfast linen using Weeks Dye Works and Gentle Art threads. DMC alternative: 924, 3781, 931, 3051, 844, 310, 3865, 950, 648. Stitch Count: 80W x 80H. 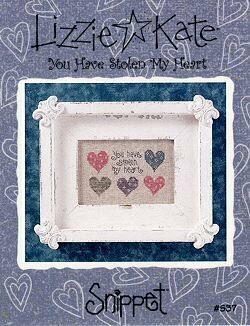 A Quick and easy design for the love of your life - "You have Stolen my Heart!" Stitch Count: 69W x 42H. This beautiful wedding announcement sends good wishes for the new couple to live "Happily Ever After." 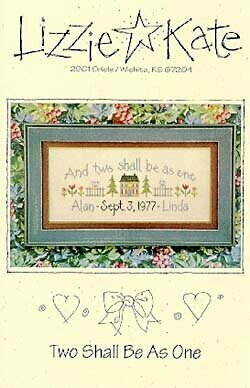 Designs include a lovely wedding sampler with flower gazebo, "United in Love", and room for the couple's name and date. 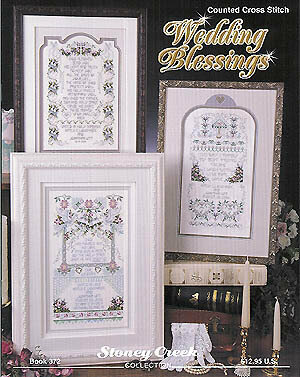 There is also a pattern for a floral picture frame. 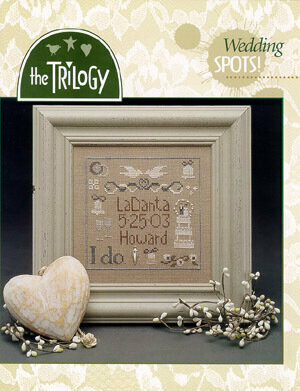 "Wedding Bower" and "Blue Wedding Announcement" models stitched on Blue Wing Jobelan fabric using DMC floss. 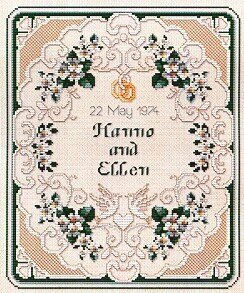 "Wedding Bower" stitch count: 136w x 170h. "Blue Wedding Announcement" stitch count: 129w x 101h. "White Picture Frame" model stitched on 27ct. White Linda cloth using DMC floss. Stitch count: 96w x 126h. 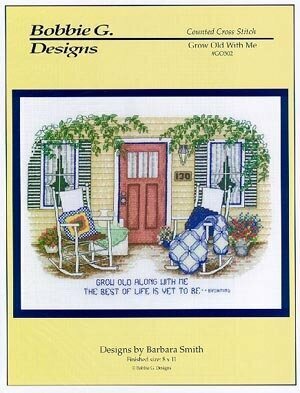 This cute Bobbie Smith design quotes Browning - "Grow Old Along With Me, The Best is Yet to Be." Stitch Count: 116H x 160W. Model stitched on 14ct white Aida using DMC floss. An elegant design by Ellen Maurer-Stroh with delicate flowers and lace border. Stitch Count: 140W x 169H. Model stitched on 32 ct Parchment or 32 ct Antique tan using DMC floss.